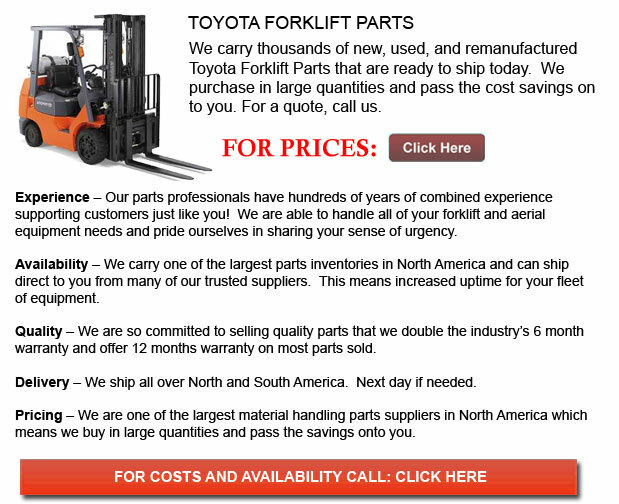 Toyota Forklift Parts - Since 1992, Toyota Material Handling inc., U.S.A., often known as TMHU, have been the best selling lift truck dealer in the United States. This company has been situated out of Irvine, California for well over 40 years, providing a comprehensive line of quality lift trucks. With a remarkable reputation of resilience and reliability, Toyota lift trucks have thrived in the competitive materials handling market. Quality is the foundation of Toyota's legendary Toyota Production System practiced at all manufacturing facilities, including TIEM, which is stands for Toyota Industrial Equipment Manufacturing, situated in Columbus, Indiana. The majority of the Toyota lift trucks sold in the U.S. are manufactured here. All Toyota equipment and components manufactured within North America adhere to the International Organization for Standardization or ISO 14001 standard. TIEM has been honored many times for its dedication to persistent development, and its environmental methods. It is the first and only producer to offer EPA and CARB-certified Compressed Natural Gas powered lift trucks on the market. To illustrate, the Toyota 8-Series IC lift trucks emit 70 percent less smog forming emissions than the current federal EPA standards and have complied with California's strict emission standards and regulations. Brett Wood, President of TMHU, associates Toyota's success to its robust dedication to constructing the finest quality lift trucks at the same time as delivering the utmost customer service and assistance. "We must be able to learn and predict the needs of our customers," said Brett Wood. "As a leader, our success also depends on our ability to address our customers' operational, safety and environmental cost issues." TMHU's parent company, Toyota Industries Corporation, often known as TICO, is listed in Fortune Magazine as the world's leading lift truck supplier and is amongst the magazines prestigious World's Most Admired Companies. Toyota Industries Corporation, as the parent company, has instilled a rich corporate doctrine of environmental stewardship in Toyota. Not a lot of other corporations and no other lift truck producer can match Toyota's history of protecting the environment while concurrently encouraging the economy. Environmental responsibility is a key feature of company decision making at Toyota and they are proud to be the first and only maker to offer UL-listed, EPA - and CARB -certified Compressed Natural Gas powered lift trucks. Yet one more reason they remain a leader within the industry. Toyota originally launched the 8-Series line of lift trucks in 2006, yet again exhibiting its leadership and innovation in the industry. Featuring an exclusive emission system that eclipsed both Federal EPA emission standards, and California's more environmentally friendly emission standards. The finished invention is a lift truck that creates 70 percent less smog forming emissions than the current Federal standards tolerate. Toyota's lift vehicles offer enhanced durability, visibility, productivity, ergonomics, and all the foremost safety equipment that has made Toyota an industry leader. The company's System of Active Stability, often known as "SAS", helps lessen the chance of mishaps and injuries, in addition to increasing productivity levels while minimizing the likelihood of merchandise and equipment damage. System Active Stability senses various conditions that could lead to lateral volatility and potential lateral overturn. When one of those conditions are detected, SAS immediately engages the Swing Lock Cylinder to steady the rear axle. This transitions the lift truck's stability footprint from triangular in shape to rectangular, offering a major increase in stability which substantially reduces the likelihood of an accident from a lateral overturn. The Active Mast Function Controller or the Active Control Rear Stabilizer also helps to avoid injuries or accidents while adding stability. SAS was first launched to the market on the 7-Series internal combustion products in 1999 and subsequently catapulted Toyota into the industry leader for safety. Since then, SAS continues to be built-in to most of Toyota's internal combustion models. It is standard gear on the new 8-Series. There are more than 100,000 SAS-equipped lift vehicles in operation, exceeding 450 million hours combined. The increased population of SAS-equipped vehicles in the field, along with obligatory operator instruction, overturn fatalities across all brands have decreased by 13.6% since 1999. Additionally, there have been an overall 35.5% decrease in industry wide collisions, loss of control, falls and overturn from a lift vehicle for the same period. Toyota's standard of brilliance reaches far beyond its technological achievements. The company maintains an extensive Operator Safety Training program to help customers meet OSHA standard 1910.178. Education services, video tutorials and an assortment of materials, covering a wide scope of topics-from personal safety, to OSHA policies, to surface and load situations, are offered through the supplier network. Since the sale of its first lift truck in the U.S. to the construction of its 350,000th lift vehicle produced in 2009 at Toyota Industrial Equipment Manufacturing, TMHU has maintained a unbroken existence in the U.S. This fact is demonstrated by the statistic that 99% of Toyota lift trucks sold in America now are built in the United States. Based in Columbus, Ind., the Toyota Industrial Equipment Mfg. campus equals 998,000 square feet of facilities across 126 acres. Facilities include a National Customer Center, as well as production operations and distribution centers for equipment and service parts, with the whole commitment exceeding $113 million dollars. The contemporary NCC was built to function for TMHU buyers and dealers. The facility includes a 360-degree showroom, a presentation theater complete with stadium seating for 32, an area for live merchandise demonstrations with seating capability for 120; a presentation theater; Toyota's Hall of Fame showcasing Toyota's story since the birth of its founder, Sakichi Toyoda, in 1867, and lastly a education center. The NCC embodies Toyota's commitment to offering top-notch client service. TMHU's 68 certified Toyota Industrial Equipment, or TIE dealers, along with 189 dealership locations all through the U.S, provide the most complete and inclusive consumer service and support in the industry. The company's new and Licensed Used lift trucks, service, components, and financing features make Toyota dealerships a one-stop shop to guarantee total client satisfaction.